705 and 707 East Nash Street. The ninety-fourth in a series of posts highlighting buildings in East Wilson Historic District, a national historic district located in Wilson, North Carolina. As originally approved, the district encompasses 858 contributing buildings and two contributing structures in a historically African-American section of Wilson. (A significant number have since been lost.) The district was developed between about 1890 to 1940 and includes notable examples of Queen Anne, Bungalow/American Craftsman, and Shotgun-style architecture. It was listed on the National Register of Historic Places in 1988. 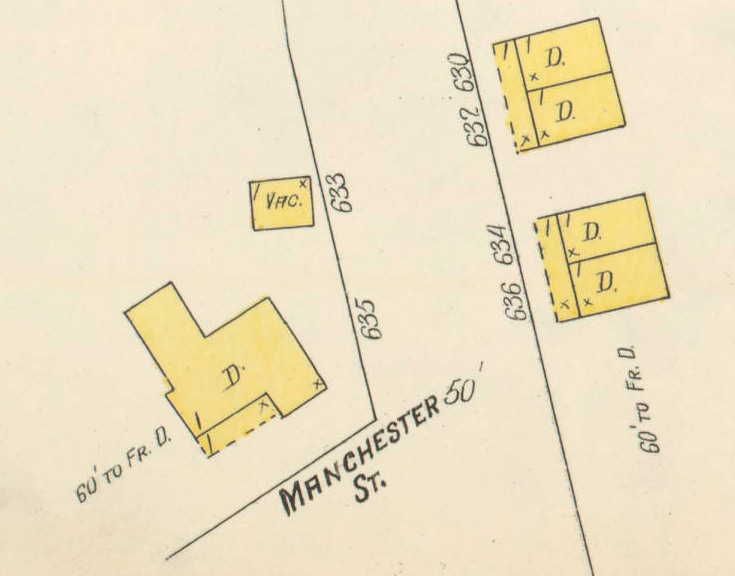 The 1908 Sanborn fire insurance map shows that these houses began life as duplexes. They were probably built as rental housing for laborers drawn to Wilson’s tobacco economy. 705 East Nash was numbered 630 and 632 East Nash; 707 was numbered 634 and 636. In the 1940 census of Wilson, Wilson County: at 705 East Nash, rented for $4/month, Lonnie Hall, 52, janitor, and children Deloris, 13, Rogers, 18, Rex’s Shoe Shop delivery boy, and Kattie, private housekeeper; plus lodgers widow Evylene Dunston, 33; Lenora Whitfield, 24; Alonza Jones, 29; and Jasper Hillard, 10. In 1942, Rogers Nathaniel Hall registered for the World War II draft in Washington, D.C. Per his registration card, he was born 22 March 1922 in Wilson; resided at 1522 – 5th Street, N.W., Washington, D.C.; his nearest relative was father Lonnie Hall, 705 East Nash Street, Wilson; and he worked for Amos Hill, 812 – 13th Street, N.W., Washington, D.C.
Lonnie Hall died 23 December 1955 at Mercy Hospital. Per his death certificate, he was born 15 March 1895 in Pender County; lived at 705 East Nash; was married; and worked as a laborer. Informant was Deloris Hall. In the 1920 census of Wilson, Wilson County: at 634 Nash, widow Florence Hussey, 34, and daughters Rosa, 13, and Elizabeth, 11. In the 1930 census of Wilson, Wilson County: at 707 East Nash, widow Florence Hussy, 46, laundry worker, and daughter Rosa, 23. In the 1940 census of Wilson, Wilson County: at 707 East Nash, widow Florence Hussey, 58, laundress at Carolina Laundry, and daughter Rosa, 33. Florence Hussey died 20 December 1946 in Wilson. Per her death certificate, she was born 3 December 1877 in Goldsboro, Wayne County, North Carolinal was a widow; resided at 707 East Nash; and had worked as a domestic. She was buried at Rountree Cemetery; Rosa Hussey was informant. Rosa Hussey died six months later — 13 June 1947. Per her death certificate, she was born 10 July 1904 in Wilson to Willie Hussey and Florence Hooks, both of Mount Olive, North Carolina; was single; and worked as a tobacco factory laborer. She died of natural causes and was buried in Rountree Cemetery. Frances Wynn Lane of Mount Olive was informant. ← The obituary of Dr. Joseph H. Ward.